What is a universal joint? It is two hinges, mounted at right angles to one another. It is primarily used to transfer torque from one plane of rotation to another. In plain english, this means you can have two shafts, with one shaft rotating the other, and the shafts can "bend" in the middle. Why do we need this? The engine on our Goldwings is fixed to the frame and does not move. It has a splined drive at the back end of the engine that rotates a driveshaft that connects to the rear wheel. However, the rear wheel has to be able to move up and down in order for the rear suspension to function. Therefore we can't have a solid shaft from the back of the engine to the rear wheel. We need to connect the engine to the driveshaft through a universal joint, that pivots at the same place the rear swingarm pivots up and down. This universal joint does a lot of work. The driveshaft rotates almost three times for every rotation of the rear wheel. This means the universal joint is being flexed back and forth many times a second, sometimes under tremendous load. As in all things mechanical, eventually the universal joint will wear out. Symptoms of a worn driveshaft are a small vibration when the rear wheel is unloaded: get up to 30-40 mph, then let off the throttle so that the engine is neither under load, nor is it performing engine braking - a little sweet spot in between power and decleration where the universal joint can flop around a bit. If you feel a bit of vibration in your footpegs when you do this, your driveshaft is starting to get a bit loose. If you start feeling a clunk every time you let off the throttle, it's possible that your universal joint is about to fail. Have a look at what a failed GL1500 universal joint looks like. A failed universal joint can be catastrophic: at worst it can destroy the swingarm (from the inside!) and lock up the rear wheel causing a skid and crash. 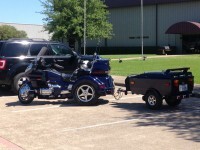 At best it will leave you completely stranded with no option but a flatbed or trailer to get your bike home. In 1997, when Honda released the Honda Valkyrie with the Goldwing's GL1500 engine, they spent some time re-engineering the transmission and drivetrain, beefing it up to handle the added power of the Valkyrie's six carburetors. 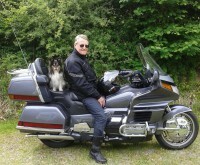 The result is that 1997 and newer GL1500 Goldwings have beefed-up transmissions, universal joint and final drive. Fortunately, the beefed-up universal joint can be fitted to all years of GL1500. Several years back, Honda had a problem with the suppliers of universal joints, and there were none available for quite some time. 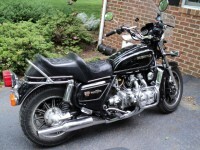 As a result, many GL1500 owners had to park their bikes, or roll the dice with a used one from eBay. At least one aftermarket supplier started a service rebuilding them, replacing the previously-unserviceable bearings with replaceable and greasable Timken bearings (the OEM Honda universal joint contains sealed bearings that cannot be greased). However, as of the time of writing, there are easily obtainable from Honda. It's a good idea to replace the universal joint boot at the same time you replace the universal joint. If you are putting an upgraded universal joint in a pre-1997 GL1500, you must replace the boot, as the beefier universal joint will not physically fit in the older, narrower boot. According to the official Honda Service Manual, an unbelievable amount of parts have to be removed in order to replace the universal joint, from the wheel, swingarm, battery box, and more. In reality, this is not true - for earlier GL1500's the universal joint can be removed without disassembling anything at all. For later GL1500's (and to install the larger universal joint in earlier GL1500's) the universal joint can be replaced by removing one of the swingarm pivots and sliding the swingarm slightly to one side. 1. Start with the motorcycle on its center stand. Remove the seat and the side covers. The bottom cover of the trunk must now be removed. There are four recessed screws along the bottom, near the outer lip. In this picture, I am removing the leftmost screw. Remove all four screws. 2. Gently slide the left side of the lower trunk cover backward to disengage it from the tabs on the bottom of the trunk sidelight/reflector. Be careful, as these tabs are fairly brittle, and easily broken if forced. 3. Pull the tab at the front of the lower trunk cover free from the antenna frame. Repeat the process to free the right side of the lower trunk cover as well. 4. With the sides of the lower trunk cover free, slide the cover forward so that it is no longer held in place by the trunk and saddlebag release levers. 5. Once free of the release levers, lower the lower trunk cover and put it aside somewhere soft where the paint won't be scratched. 6. There are four screw/trim covers that must be removed. They are removed simply by prying them away with your fingernail, or a small, thin, flat-blade screwdriver. They should be tight - if they are loose, it's a good idea to give them a slight gentle squeeze with a pair of pliers to make sure they grip the trim tightly. They can be easily lost if they are not tight enough. Two of the covers are on the back of the bike, at the inner lower edges of the saddlebags. 7. The other two are on each side, just a few inches from the back of the bike. 8. Remove the screws exposed by each of the screw/trim covers. 9. Once the two screws are removed, each lower rear saddlebag cover can be removed. Set them aside. 10. Wiring for the lights will be exposed by the removal of the lower rear saddlebag covers. You may have a simple 3P connector such as the one I am holding, or you could have a rats nest of aftermarket wiring such as is shown in the top of the image. I decided after seeing this mess of wires and vampire clips to cut out and replace all of this wiring. These connectors connect the lights on the saddlebag to the bike's wiring. Because we're removing the saddlebags, these wires need to be disconnected. 11. Open the saddlebags. Inside each saddlebag, at the top, near the rear of the bags, you will find the release mechanisms. It consists of a cable, connected to a nylon piece that snaps over the metal release bar. Unsnap the nylon piece from the bar. 12. Rotate the nylon piece on the cable, and pull the cable free through the slot. Set aside the nylon piece. 13. Here you can see the end of the release cable after the nylon piece has been removed. Squeeze the four locking tabs surrounding the cable and push it through the hole. 14. Remove the four bolts fastening each saddlebag to the frame. 15. Here you can see the saddlebag with the bolts removed. The large circle on the left is an adhesive rubber patch that can be removed to gain access to the rear brake caliper, in order to bleed the caliper without first having to remove the saddlebag. 16. Tip the top of each saddlebag outward and make sure the release cable has come fully out of the bag. 17. gently lift the saddlebags away from the motorcycle. Here you can see the emergency release button on the top of the saddlebag that is accessed from inside the trunk. The right saddlebag also has the compressor air outlet hose which must be pushed through the hole in the saddlebag before the saddlebag is removed. 18. Remove the bolts holding the lower side covers in place on both sides, and remove the covers. 19. With the covers removed, you will be able to see the joint between the exhaust collector and the mufflers. 20. Loosen (but do not remove) the bolts holding the clamps that clamp the mufflers to the collector. It is a good idea to soak this area with a penetrating lubricant such as PB Blaster. I tend to soak this area with PB Blaster several times over several hours in advance of doing this process. 21. Remove the support bolt fastening the back end of the muffler to the frame. 22. The mufflers need to be rotated downward in order to gain access to the wheel axle, as seen here. If the mufflers are able to rotate on the collector, then great - you will have no problems. However, most mufflers are seized onto the collector. The best way to rotate them is to use a strap wrench near the very front of the muffler, while supporting the back end of the muffler. This applies rotational force without applying too much leverage to the expensive collector. 23. Using a 27mm socket, remove the axle nut from the right side of the axle. 24. Put a couple pieces of thin wood underneath the rear tire to support it. I find it's easier to put the wood on top of a piece of cardboard, to make it easier to slide in and out. 25. Loosen, but do not remove the left lower shock mounting bolt. 26. Loosen the axle pinch bolt on the left side of the wheel. 27. Once the axle pinch bolt has been loosened, the axle should be able to slide out to the left side of the bike. If it needs a little persuading, use a rod (or in this case, a long socket extension), push one end up against the axle, and give the other end a couple taps with a hammer. The axle should break free easily. 28. Pull the axle out from the left side. 29. Remove the washer as shown. 30. Leave the lower shock mounting bolt in place, as it will be providing the leverage on the brake caliper bracket required in order to loosen the brake caliper bolts. 30. Remove the brake caliper mounting bolts, and pull the caliper free. Note: The Honda manual has you removing the caliper and the caliper bracket as an assembly, but in practice, this is next to impossible due to clearance issues. Save yourself a lot of time and frustration by removing them separately as I show here. 31. Suspend the caliper using a bungee or coat hanger. Do NOT allow it to dangle by its brake hose! 32. Remove the lower shock mounting bolt, and pull the brake caliper bracket free. It is held in place with both the wheel axle and the lower shock mounting bolt. 33. Remove the collar from the wheel hub. 34. Slide the wheel left (remember the cardboard?) to free the wheel hub from the final drive. 35. The driven flange has slider pins that slide into the hub. They may be slid outward somewhat as shown in this picture. In order to gain the clearance required to remove the wheel, push the driven flange into the wheel hub as far as it will go. 36. Using a beefy 17mm hex drive, break loose the right swingarm pivot. I first tried using a large socket driver with a 1/2" drive, but it did not budge. 37. I ended up having to use an impact wrench to break it free. 38. Looking at the boot covering the universal joint, the reverse mechanism is in the way. 39. Pull the reverse lever up, which will rotate the mechanism out of the way. 40. Pull the boot free of the back of the engine. This will reveal the universal joint. 41. I pushed a magnet into the boot to collect any metal particles that might be there. 42. There were obvious signs of metal chips in the bottom of my boot, further evidence that my universal joint was in the process of self-destructing. 43. Remove the right side swingarm pivot. 44. You should be able to look into the cavity and see the swingarm bearing. 45. Push the back end of the swingarm to the left. This will pull the right front of the swingarm back. You will see the bearing move to the rear as a result. This gives us the extra clearance we require to replace the universal joint. 46. Using a 14mm socket or wrench, remove the four nuts holding the final drive to the back end of the swingarm. 47. Pull the final drive backward, free of the swingarm. The driveshaft will come with it. Be careful to support the swingarm as it is pulled free of the swingarm - the back end of the driveshaft has an oil seal that can be easily damaged. 48. Remove the final drive and gently pull the driveshaft free of it. Set them both down. Make sure the vent on the final drive is facing upward, or it will drain its gear oil out onto the floor. Note that the final drive in the picture came out with the "spider" or driven flange - this driven flange may end up staying in the wheel, in which case you would see the splines that connect the driven flange to the final drive. 49. Disconnect the negative terminal from the battery. 50. Remove both terminals from the starter relay. 51. Remove the starter relay from its mount (it is held in place with a rubber strap). This will give us additional clearance to remove the universal joint. 52. Use a flat blade screwdriver to pull the back of the driveshaft boot free of the swingarm. 53. Use a flat blade screwdriver to gently push the universal joint backward off of the transmission output shaft. 54. Maneuver the universal joint to one side of the output shaft. 55. Maneuver the boot around the output shaft, and then pull the boot out entirely - I used pliers to get a good grip on it to do so. 56. Once I removed my boot, I found one of the causes of my universal joint's failure: the bottom end of it, near the rear, was torn through, allowing moisture and dirt to enter and foul the universal joint. 57. The old universal joint can now be pulled free of the swingarm. 58. Side by side, it is obvious the changes made to the new swingarm boot design to accomodate the larger universal joint. 59. We will need molybdenum paste to lubricate the various splines during reassembly. The old Honda Moly 60 paste (on the right) has been superseded by the much more expensive M-77 assembly paste (on the left). Either will work fine. 60. Apply the moly paste to the transmission output shaft spline. 61. Apply the moly paste to both of the female splines on each end of the new universal joint. Make sure when installing that the longer end of the universal joint is put on the transmission output shaft - so the longer end faces the front end of the bike. 62. Slide the universal joint into the front end of the swingarm. 63. Squeeze the new boot in preparation of installation. 64. Maneuver the new boot into place - I find it easier to come in from below. Make sure the wider end is at the rear, connecting to the swingarm. 65. Slide the boot over the universal joint and output shaft. Stretch the boot over the swingarm so that its flange seats securely in the groove at the front of the swingarm. This ensures a good seal on the boot and swingarm, so that moisture cannot enter. Getting this boot securely in place on the swingarm is probably the most frustrating part of this entire process! Notice that the universal joint is pushed back into the swingarm. This is important for when we install the driveshaft. 66. Lubricate the splines on the driveshaft with moly paste. 67. Remove the driven flange from the final drive. Lubricate the spline on the driven flange as well as the inside of the drive with moly paste and insert it into the rear wheel. 68. There are two types of driven flanges: 5-pin and 6-pin. If you have a 6-pin flange, lubricate the pins with moly paste. If you have a 5-pin flange, do not lubricate the pins - make sure they are clean and free of grease. 68. Lubricate the spline on the final drive with moly paste. 69. Carefully push the driveshaft back into the final drive, seating the oil seal. Supporting the driveshaft, guide the driveshaft back into the swingarm. 68. Normally, attempting to get the driveshaft into the back end of the final drive is an exercise in frustration, because the back end of the final drive flops around, and rests on the bottom of the swingarm tube, not up in the center where it needs to be to line up with the driveshaft. However, because we can manipulate the position of the universal joint from the front, pulling it forward and back, which lifts the back end up and down inside the tube, it makes the job much easier. Guide the final drive into place on the swingarm and make sure it has fully engaged the splines in the back end of the universal joint. Once in place, install the four nuts holding the final drive to the swingarm finger tight. 69. Push the universal joint back into the swingarm as far as it will go, and move the front end to line up with the transmission output shaft. Note: you may need to rotate the transmission output shaft by hand in order for the splines to line up - if this is the case, make sure the transmission is in neutral and that the reverse lever is down. Once in place, make sure the universal joint slides all the way up onto the output shaft. 70. Pull the front of the boot up over the output block and make sure it is properly sealed, with the rubber flanges fully seated in the grooves. 71. Replace the starter relay on its mount. 72. Reinstall and tighten both terminals onto the starter relay. 73. Reconnect the negative terminal onto the battery. 74. Apply lithium grease to the end of the swingarm pivot. 75. Move the swingarm so that the pivot bearing lines up properly, and screw the pivot into place. 76. Torque the pivot to 72 ft-lb. 77. Push the wheel hub into the final drive, so that the splines mate. 78. Replace the collar into the wheel hub. 79. Position the brake caliper bracket. 80. Lightly grease the smooth (NOT the threaded) portion of the lower shock mount bolt. Insert but do not fully tighten the lower shock mount bolt - just enough to hold the caliper bracket in place. 81. Clean and lightly grease the wheel axle. 83. While holding the washer in place, push the axle in place from the left side. Make sure it goes through the swingarm, washer, brake caliper, spacer collar, wheel hub, and final drive (in that order). 84. The axle threads should protrude on the outside of the final drive. Thread the axle bolt in place and tighten just enough to pull the axle fully into place. Do not fully torque at this point. 85. Using a torque wrench, tighten the lower shock mounting bolt to 51 ft-lb. 86. Using a torque wrench, tighten the axle nut to 80 ft-lb. 87. Using a torque wrench, tighten the axle pinch bolt to 23 ft-lb. 88. Once the axle is installed and tightened, we now fully torque the final drive nuts, to 47 ft-lb. 89. For lubricating brake components, use a high-temperature grease intended for brake applications. 90. After cleaning the brake caliper with brake cleaner, position it in place over the brake rotor. Be careful not to damage the brake pads while positioning the caliper. 91. Use brake grease to lubricate the smooth portions of the caliper mounting bolts. 92. The upper caliper mounting bolt actually screws into the caliper itself, and the smooth pin portion of the bolt slides into this rubber boot on the caliper mounting bracket. 93. Insert and tighten the lower caliper mounting bolt. The upper caliper mounting bolt/pin is torqued to 20 ft-lb, and the lower one is torqued to 12 ft-lb. 94. Rotate the mufflers back into place, insert the bolt, and push the nut into place on the back. 95. Hold the nut in place with a wrench, and tighten the bolt to fasten the muffler in place. 96. Tighten the muffler clamps on both sides. 97. Replace the lower side covers and bolt into place. 99. 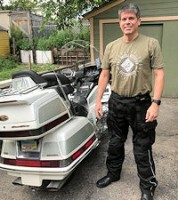 Before pushing the saddlebags fully into position, make sure to push the release cables securely into their holes, as well as pulling the compressor hose through into the right saddlebag. 100. Bolt the saddlebags into place with the four bolts on each side. 101. Thread the nylon piece onto each of the release cables, then snap them onto the release bars. 102. Reconnect the tail/brake wire connectors. 103. Replace the lower rear saddlebag covers. There are round, molded pins on each cover that seat into holes in the existing plastic - make sure they seat correctly, or the covers will not fully fasten in place. 104. Replace the screws fastening each cover in place. 105. Push the trim clips back into place. Make sure they are tight - if not, clamp them gently with a pair of pliers to make sure they do not fall off. 106. Lift the lower trunk cover into place. Push it forward to clear the fronts of the release levers, then pull it up and back over the top of the levers. 107. Fastening the lower trunk cover in place takes a bit of finesse - and practice. Position the cover so that ALL of the tabs on both sides are lined up, then push the cover up and forward to lock it into place. You'll find that if you attempt to do one side at a time, the process of locking one side in place will often unlock the other side - an exercise in frustration. Keep in mind the fragile, brittle nature of the tabs! 108. Replace the four screws holding the lower trunk cover in place. Really appreciate this tutorial. I need to replace a torn U joint boot this winter on a 93 Gl1500A. Seems I should plan on replacing the U joint with the beefier model and boot as well. Thanks. No Wife, No Job, No Worries. Thank you for a 1st class tutorial. My 2000 SE (white/green) has 83K miles, I'm ready for this repair now ! Thank you for this really detailed instruction. "It's a good idea to replace the universal joint boot at the same time you replace the universal joint. If you are putting an upgraded universal joint in a pre-1997 GL1500, you must replace the boot, as the beefier universal joint will not physically fit in the older, narrower boot. According to the official Honda Service Manual, an unbelievable amount of parts have to be removed in order to replace the universal joint, from the wheel, swingarm, battery box, and more. In reality, this is not true - for earlier GL1500's the universal joint can be removed without disassembling anything at all. For later GL1500's (and to install the larger universal joint in earlier GL1500's) the universal joint can be replaced by removing one of the swingarm pivots and sliding the swingarm slightly to one side." I'm going to be doing the ujoint on my '88 in a couple of weeks. You mentioned earlier models it can be removed without disassembling anything at all. Does the swing arm need to be shifted for this year? Also when I searched the part # you listed for the boot I don't get any matches. Honda lists the ujoint with the same # but the boot comes up as 52104-MN5-000 for all years GL1500. Maybe they changed the # ? Ok i guess it does exist. Just found the boot on partszilla for $13.15. The honda parts supplier I was checking shows a different #. I am going to replace my U joint this winter as I discovered a split in the boot last year and have no Idea how long the U joint has been exposed to the elements. My bike is a 97 SE with 100,000 miles. Is there any sense in changing the swing arm pivot bearings due to age or mileage?? I just replaced my U-Joint on Monday. As WingAdmin has said, installing the boot is a frustrating challenge. To back up a bit, I put this off a couple of weeks because I did not know if it could be done with the bike on a jack. A jack would have been in the way. The pictures in the tutorial appear to show that the wheel assembly is only removed from the final drive and set aside in the frame. And then the final drive is removed without taking the wheel assembly out of the frame. I didn't quite know if that was possible. I'm here to tell you that it is. Learn something new every day. As to the boot, I tried installing it without the U-joint and it was not too difficult. Trouble is, when I tired to install the U-Joint, the boot came off of the swing arm. So I tried doing it with the U-Joint in place. I even removed the battery and battery box to try and gain more access. That didn't give me any more access. I must have spent an hour trying to fit it up. What finally worked was to move the swing arm back into position and install the pivot bolt. Then with the U-Joint in place in the boot and the boot at the swing arm, I was afforded a little more room to pop the boot over the outside edge of the swing arm raised lip. The right side of the bike frame was preventing me from working the lip of the boot over the lip of the swing arm while the swing arm was out of position. Once the swing arm was back in its proper position, the boot was a little easier to manipulate. Only took about five minutes and it was in place. Good luck all of you that are going to tackle this job. It will take you all day but it is worth the effort and you probably will never have to do it again. OK I'm at step 36 and I am stuck. I can not figure out how to get this chrome piece off, (see arrow), baring my unwillingness to remove the bolts underneath the passenger footrest because I don't want springs to go flying all over if its the wrong set of bolts to remove. Assistance in this matter is greatly appreciated. Not sure what year your wing is. I did mine last year on my 88 without loosening the swingarm. I had plenty of room to maneuver it out. To remove the chrome piece under the passenger footrest, you will have to remove the footrest. I do not think you will be able to replace the universal joint without removing that 17mm socket bolt. The '88 and '89 are constructed a bit differently. I've heard that the universal joint will come out through the swing arm tube on those models. But I'm here to tell you, it will not come through on your '96. It has to come out the forward end. Here is a picture and description of how to remove the SE passenger foot rest from the service manual. I too have heard certain years the swingarm must be shifted. On my 88 the ujoint came out the forward end without shifting the swingarm. The newer/larger updated ujoint went back in from the front as well. I didnt get a close up shot when i did it but you can see the frame layout in the pic for a comparison to yours. I had to wiggle it around a bit to pull it through. MikeB wrote: But I'm here to tell you, it will not come through on your '96. It has to come out the forward end. No lye, but I swear I almost had it out 400 times already. Thanks for the diagram, big help. There are no springs that will go flying when removing the passenger footrest. I've had mine off many, many times. You first retract the footrest to its lowest point, then remove the two screws holding the bottom plastic cover in place. Next, you'll see flat pieces of metal on the bottom, that hold the rubber accordion boot in place. Pull them free, so you can raise the boot. This exposes the two hex bolts that hold the footrest in place. Remove the bolts, and the footrest comes free. Oh, and incidentally, I have a feeling I might have cheated a bit and used an impact wrench when I loosened my pivot bolt. I tightened it with a torque wrench, but broke it free with an impact wrench. WingAdmin wrote: Oh, and incidentally, I have a feeling I might have cheated a bit and used an impact wrench when I loosened my pivot bolt. I tightened it with a torque wrench, but broke it free with an impact wrench. Well wise move since I used a breaker bar and when the bolt let loose I ripped my knuckles up on something. I was wearing mechanics gloves just to keep general dirt off the hands but it skinned my knuckles right through the gloves. Should have been wearing armored gloves. Anyway I got the U-Joint out, didn't look so bad but its defiantly original and has 150k on it and since I was all in there its cheap insurance barring a failure and being stranded. Ok onward to replacing the dash board. Mine melted. Yes I have a Tulsa tall windshield. Yes I remember parking with the dash facing the sun. No I didn't know about it happening prior, else the t-shirt. The melting happened in about 45 minutes. I went into a restaurant to eat, came out and around the warning lights and gas gauge was melted. It's not too bad but defiantly melted, but now I got a great excuse to replace bulbs with LED lights. Oh I was told by the guy that sells the snap in dash hood, (which I purchased after the fact), to use a black marker around the edge of the windscreen so that sun would not enter the edge. So I did, you don't really notice it at all. Hope that and the dash hood prevent it from happening in the future. MikeB wrote: I just replaced my U-Joint on Monday. As WingAdmin has said, installing the boot is a frustrating challenge. OK, this is my third day trying to get this boot onto the swing arm. I spent about two hours each on the first two days, last weekend. Today I started at about 7am and quit at noon. I removed the alternator to see if that provided easier access, (not really). I did move the swing arm back forward and replaced the pivot bolt but every time I start to stretch the boot onto the swing arm the other side of the boot just comes off. This is really sapping my energy to work on bike. I already had to cut a stud off the final drive due to a frozen bolt, but I'm over that and a new stud is in place. Its this boot that is killing me. I'm going through the entire "how-to" posts encase I missed something. I figured I would quote this post as he states "Only took about five minutes and it was in place" (oh man what i wouldn't give for that to happen. I think I'm going to try to dry fit it without the U-Joint, just to see if that helps me visualize things. ANY advice, no matter how small, on getting this boot back on would be greatly appreciated. What I left out of the post was I sprayed a little silicone on the inside of the boot to help slipping it over the swingarm. MikeB wrote: What I left out of the post was I sprayed a little silicone on the inside of the boot to help slipping it over the swingarm. How are you keeping one side from coming off while pulling the other side over the lip. Right now I have the side nearest the swingarm on first with about half of the bottom and half of the top, but when I go to pull the other side, those sides just pop off. I'm going to see if I can get someone to hold the installed sides on while I work on pulling the boot on the other side. I'll try silicone, heck I'll try anything, thanks. I'm sure there's a great Trojan vs girth joke in here somewhere. FYI for anyone wondering, here is a photo of the two U-Joints side by side, the one on the left is a reinforced in vital areas and appears to be flame hardened the old one appears to be cast. My u-joint was not bad looking, but its cheap insurance to replace it. The boot has proven to be the most difficult thing I have encountered on these "how-to's", but it too will yield. I wish I could tell you how I did exactly but I don't really know. Perseverance is what paid off. I just had to slip it on a little at a time from outside to inside if I remember correctly. I do remember that trying to stretch it over the swing arm is not the way to do it. It had to slide over the swing arm lip. That is where the silicone came into play. I too worked at it for an hour or better while the swing arm was still floating. What did the trick for me is reinstalling the right pivot bolt and working at it again. That little but of forward positioning as well as the swing arm not floating away as I worked on it is what worked for me. The trick is that there is a small lip on the boot that fits into the groove on the swingarm (and on the engine side as well). I did have a bit of grease on there (picked up mostly from the joint itself). I got one side of the boot in place, with the boot's lip solidly in the groove, then put pressure on it to hold that lip there while using a small tool to pull the lip around the other side, the same way you pull a tire bead onto the rim. Once in place, I made sure that lip was well seated all the way around. I won't lie and say I got it on the first try, but once I got it on the first time, it was a lot easier on tries after that (had to do it multiple times to take pictures). MikeB wrote: I wish I could tell you how I did exactly but I don't really know. Perseverance is what paid off. I just had to slip it on a little at a time from outside to inside if I remember correctly. I do remember that trying to stretch it over the swing arm is not the way to do it. It had to slide over the swing arm lip. That is where the silicone came into play. Do not stretch, OK, (that's how I got the first half on was by sliding and pressing in the boot channel into the lip of the swingarm) OK, I'll keep trying, perseverance and all. MikeB wrote: What did the trick for me is reinstalling the right pivot bolt and working at it again. That little but of forward positioning as well as the swing arm not floating away as I worked on it is what worked for me. Ya, I figured that out within the first 10 mins. WingAdmin wrote: with the boot's lip solidly in the groove, then put pressure on it to hold that lip there while using a small tool to pull the lip around the other side, the same way you pull a tire bead onto the rim. Once in place, I made sure that lip was well seated all the way around. OK, that is where I'm at right now with one half of the boots lip solidly in the groove. I have a friend coming down from Michigan, I am going to ask him to put pressure on the installed boot while I try to pull/slide the boot from underneath the bike. MikeB wrote: That is where the silicone came into play. WingAdmin wrote: I did have a bit of grease on there (picked up mostly from the joint itself). OK, well this is something I have not done yet and it seems to be a common denominator. I have been trying real hard to keep the boot clean as to avoid greasing up the boot mount area, (I don't want it to slip off once installed). But, it seems like that's not a problem, so, I will do so if needed. WingAdmin wrote: (had to do it multiple times to take pictures). OH MY GOD, It just goes to show how much time and effort is taken to make these instructions, what a wonderful group of helpful people. Kudos WingAdmin and others! To end the ongoing saga, I did get the u-joint boot on with help from a friend. Unfortunately it just doesn't appear correct, meaning that the boot appears to be crooked like some of the boot is installed too far back onto the drive shaft. I can feel some of the lip of the shaft through the boot and in other area's I just can't tell. And in general, I just can't tell whether it's on correctly or not. I have called it a day. The boot is on the bike and seems to be sealed up. Only time will tell when its driven if it stretches off the shaft, or maybe self-seats itself in the process . If not, I go back Jack do it again. So it's a not so much a victory but I'm counting it as a victory none the less. The article on replacing the ujoint on the gl 1500 is excellent. Does anyone know where I can get an article on how to replace the ujoint on a gl1500 she TRIKE? Lehman.